Today interest in healthy lifestyle and sport is getting stronger and gains more and more followers. People want to keep their souls and bodies young, straight, and choose the most appropriate ways to achieve these needs. Gym, yoga, Pilates, box, fitness, basketball, skiing, skating, racing, bodybuilding – this list is boundless. Our brand new compilation of the hottest WordPress web templates from TemplateMonster is devoted exactly to Sport and its different branches. There is only one word “Sport”, however, how many kinds and directions it has. For someone, sport is just a hobby, the way to relax, for others it is even more than air, a way to live. Obviously, sport is the way of people’s mentality, it exists in each person, but on a different level and stage. The audience of all sport activities is uncountable, and for sure, having a website for any of them will get it to success. There are so many cases which deal with sport and so many ways for websites to cover each niche. Thanks to a website you can easily arrange a sport news blog, channel, or club. You can even promote or sell sport equipment and sportwear, build online personal trainer, gym, athlete website. We carefully selected these themes according to all peculiarities and requirements of each sport website type. Blog website designs, for example, are great for sport blogging and news. You can share posts, articles and open hot discussions about different sport events, stars, trends, ratings and so on. Portfolio templates will absolutely fit for promoting your sport club, gym or any other establishment. All themes include a huge number of elements to make your website alive and stylish. A gallery page template allows nice demonstration of image content. Animated counters will let you display percentage rations of different aspects in a dynamic, engaging manner. The integration of social icons and subscription service makes it easy for your visitors to follow you and share posts on many different social networks. You will be impressed by dozens of beautiful layouts, where each page is a joy to look at. Thanks to customization options galore you will not spend much time and efforts to edit website details. Basically, each theme will definitely find its’ owner, since all of them are well-designed and highly developed. When it comes to launching a good-looking, professional website, there’s no better option than a ready-to-use WordPress template by TemplateMonster. We offer the hottest 20 ready made website designs of this year because of their power, popularity and amazing style. All themes aim to express not just professional level of design and functionality of the website, but the motion, spirit and power of the sport. So let’s take a close look at this collection 2016 of the best Sporty WP Themes. 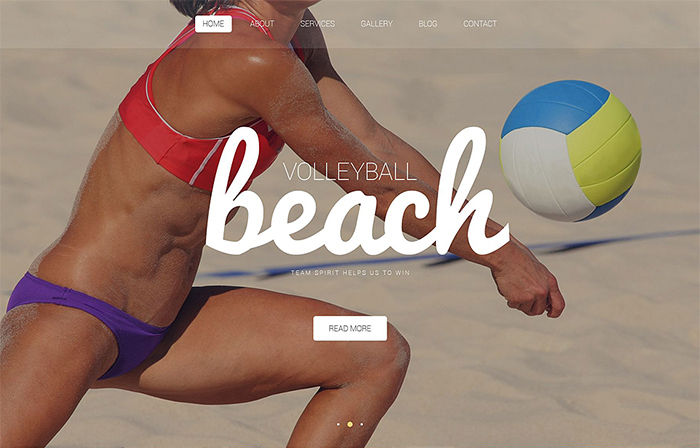 This WordPress theme with its strict and sport oriented design will definitely fit to any sport based website. It comes with the variety of easy to use customization features. No need to have any coding experience since with the theme you get Templatemonster’s drag-and-drop page builder. The Sensei theme is equipped with the Timetable plugin for creating schedules of your events. The theme is fully responsive and it will be fully visible on any available device. This template is also bundled with the detailed documentation for getting familiar with all its functions and features. 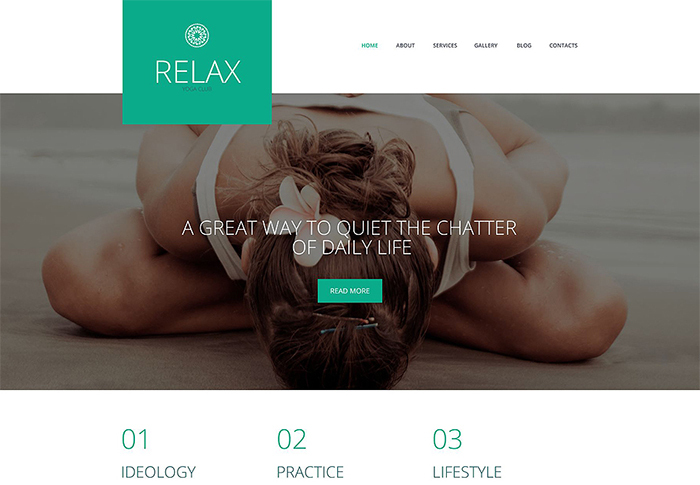 Shanti is the fully responsive WordPress theme that was designed with the soft, calm and peaceful color scheme. All the theme elements are designed in accordance with yoga gracefulness, which will lure more clients to your yoga studio. The theme was developed with the clean code due to all latest standards, plus it’s fully responsive and SEO friendly. The Templatemonster’s drag-and-drop page builder will help you to set up all your website pages much faster. 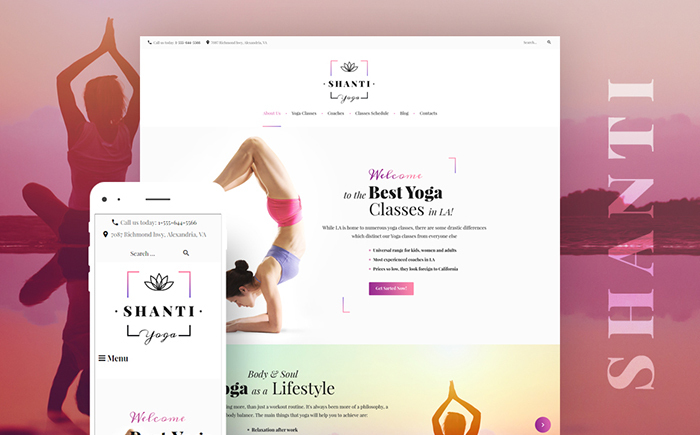 The Shanti WordPress theme comes with the very detailed documentation and you can always contact professional support team for more detailed support. This IronMass WordPress theme has everything you need in order to use it for any sport oriented website. 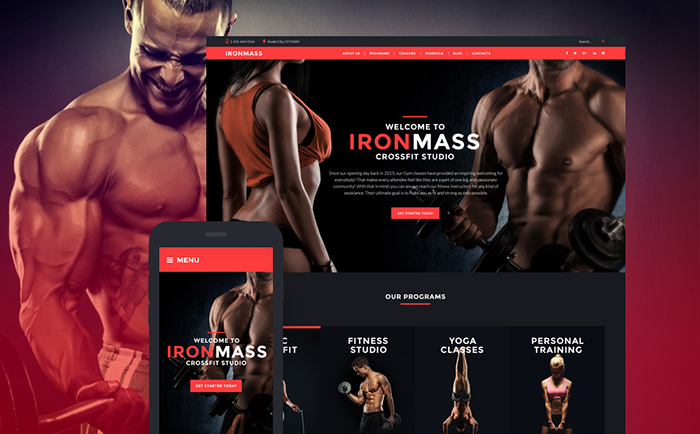 With its sporty design and layout you can set it up for gym and fitness website. Being responsive the theme will work smooth and nice on any device. The template suits even for not tech savvy person since it is equipped with the Templatemonster’s drag-and-drop page builder. You can show up your schedule easily with the help of the included Timetable plugin. The theme comes with the extensive documentation with the detailed instructions on how to use all theme features. Are you passionate about bikes and seeking to get a blogging website to share your passion? 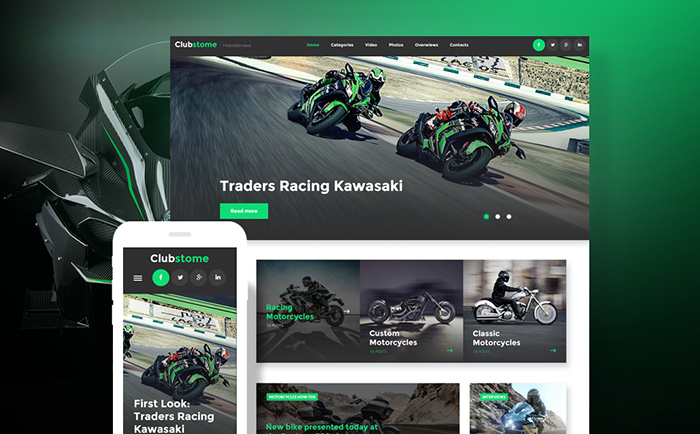 Then Clubstome WordPress theme is the one you need. It has a great and very intuitive design with lots of features for sharing your blogs, videos, and photos. On the built-in slider you can highlight the most interesting events to attract worldwide bikers. The theme is SEO friendly and fully responsive and will look awesome on any device. Our professional support team is available 24/7 and would be glad to assist you with any inquiries. 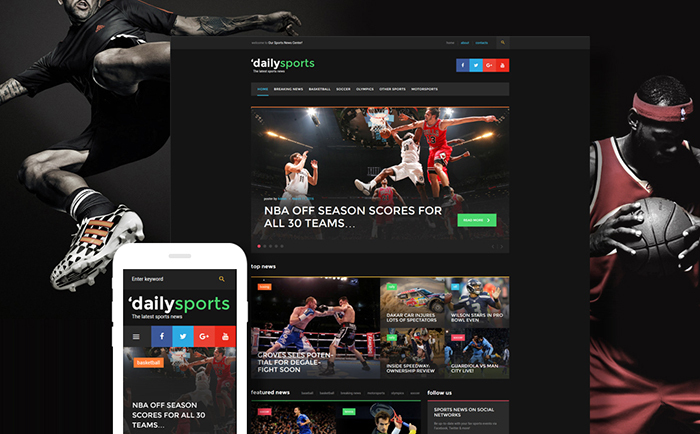 The DailySports is a top notch blogging Wodpress theme that is a great match for sport news or any business magazine website. The theme is equipped with the variety of premium widgets that will help you building awesome and catching the eye layout. The theme is packed with the slider where you can point out the most incredible news and services. You can set a subscription feature to the sidebar for keeping your visitors informed regarding recently released news. The template is fully responsive and your news will be easy to read on any mobile layout. The DailySports is well documented and you can also get in touch with friendly support for help. 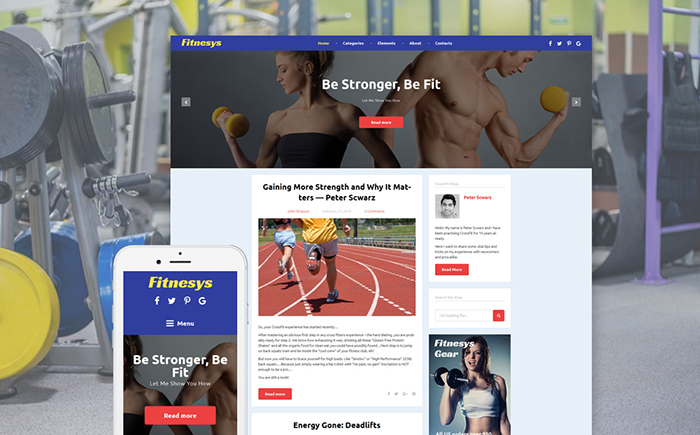 The Fitnesys was designed and developed for fitness and gym niche, but it’s not limited by this, you can use it for any sport oriented website. The website slider will help you focus your clients’ attention on your main events and services. The theme is equipped with the stick-to-top menu which will make your website browsing more convenient. We all know how important is to communicate with clients therefore we have included the contact form and newsletter subscription features. The Fitnesys is fully responsive and retina ready and your website will look sharp on any device. 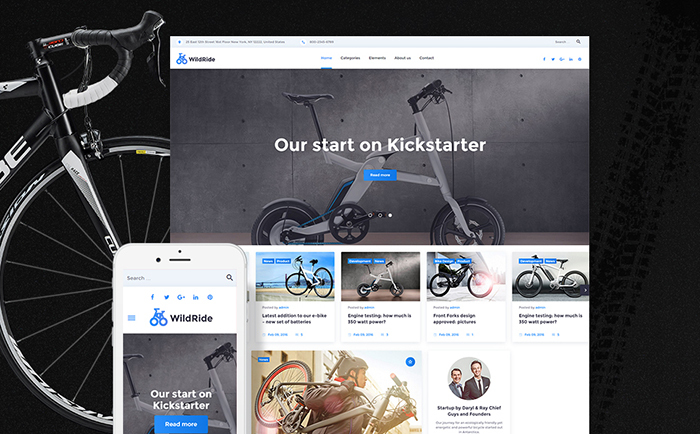 The Wildride is an outstanding blogging WordPress theme for bicycle sport sphere. Developed and built with care your visitors will be impressed with the intuitive layout and design. You can select from a variety of blog listing layouts to suit your specific project. Website slider is a great tool to show up your main services, news, and events. The template was built with the Bootstrap framework and is fully responsive, plus the Wildride is SEO friendly. This Wordress Blog theme will suit best to a hockey sport oriented website. You can build a website with the info about your hockey team or about your hockey stadium. 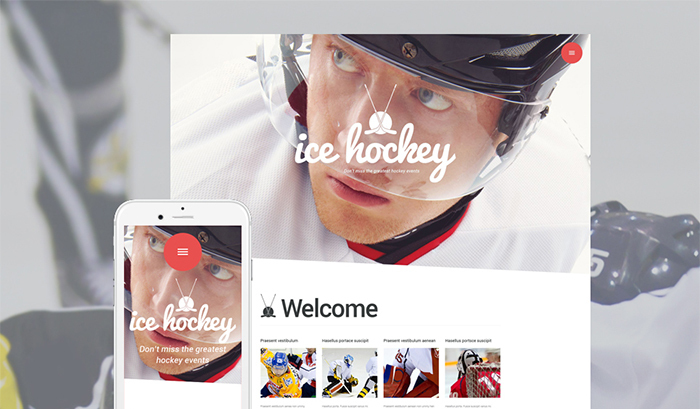 The Hockey template is equipped with the Parallax effect feature to add outstanding dynamic effects to any section on your website. You don’t need to have any coding coding skills since the template already goes with the Motopress page builder. It has drag-and-drop interface and is very easy to use.The template will perform properly on any device since it is 100% responsive. With its modern and impressionable design the BodyFuel WordPress theme will be a great choice for any sports website. The theme is bundled with the outstanding combination of customization tools. You can share your schedule easily with the help of Timetable plugin that you get with the template. There is also Appointment manager included for letting your clients setting up private lessons. You can create a unique website with a variety of custom widgets that you get with the template. 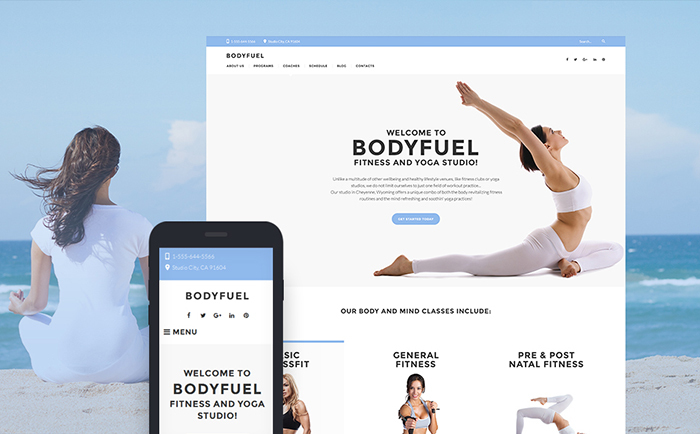 The BodyFuel is fully responsive, which makes it running nice and properly on any mobile device. Please welcome the multipurpose WordPress theme that is a perfect solution for a cheerleading website. This template is pumped up with the complex of awesome features. Nicely crafted design with the parallax effect will impress your website visitors. The Mega Menu will make your website surfing more convenient and efficient. You can share your news through the blogging feature and plus the theme has a portfolio feature for highlighting your services and works. This theme was developed with the Bootstrap framework which makes it fully responsive and it will perform correctly on any device. This fully editable and 100% responsive theme will be a nice choice for a fitness and heavyweight sport blogging website. 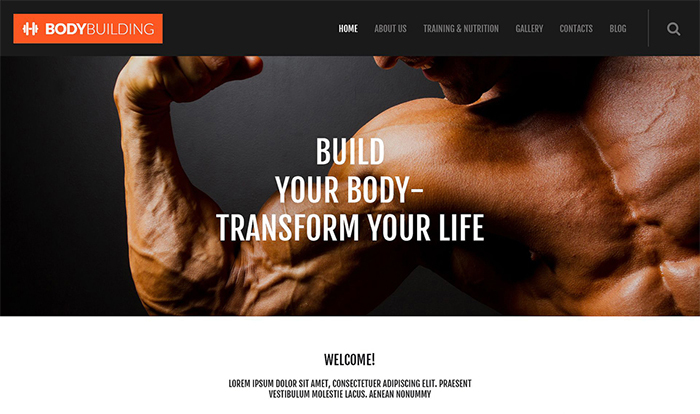 The Bodybuilding WordPress theme has the sticky menu which eases your website browsing. The template was developed to be multilingual that will help you to lure more worldwide visitors. Your visitors will definitely like your website with its all animation and visual effects. There are lots of shortcodes inlcuded to help you setting up the page with accordance to your preferences. The theme is equipped with the slider for sharing and highlighting your events and services. 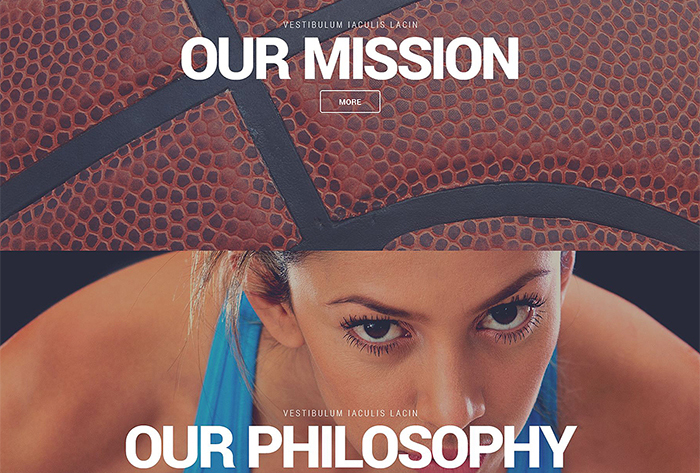 Check out this dynamic and sport-oriented design that will be a great solution for a sports website. The template has classy wide layouts, variety of customization tools that will help you adjusting it to any sport project. It’s equipped with the slider for advertising upcoming events or main services. The theme was crafted to be fully responsive to be performed properly on any device. The Valleyball WordPress theme was well developed with the clean code and using all known SEO solutions. Are you an adrenaline addicted and love any kind of extreme sport? 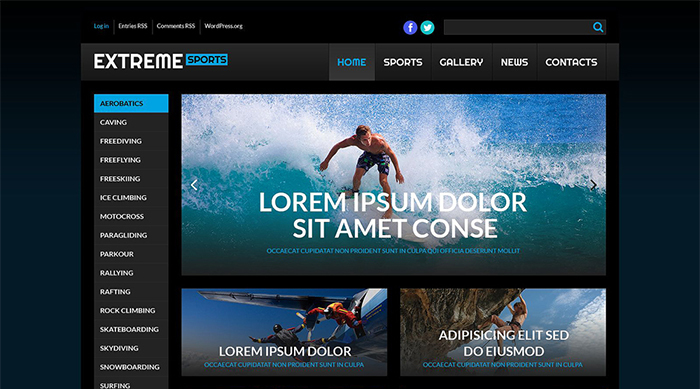 Then you definitely will like our Extreme Sports WordPress Theme. You’ll get tons of customization tools for getting it adjusted to any sports website. The MotoPress with its drag & drop editor will help you create pages much easier and faster.The theme was developed to be fully compatible with the WPML plugin. For more convenient interaction with your visitors we have equipped the template with the Olark online chat. Being developed with the Bootstrap the template is fully responsive and will perform smoothly on any device. With its sporty and stunning design this template will be a match for a sports website. The theme is packed with incredible useful tools for customizing the theme to suit your preferences. Your visitors’ attention will be attracted by parallax and other awesome visual effects. The Basketball WordPress theme comes with the social media integration and you can add your social media profiles within the widget areas. You can easily implement a multilingual feature on your website since it’s WPML ready. This template is equipped with sliders for focusing your visitors on your main services and events. Your website will work properly on any device as its fully responsive. 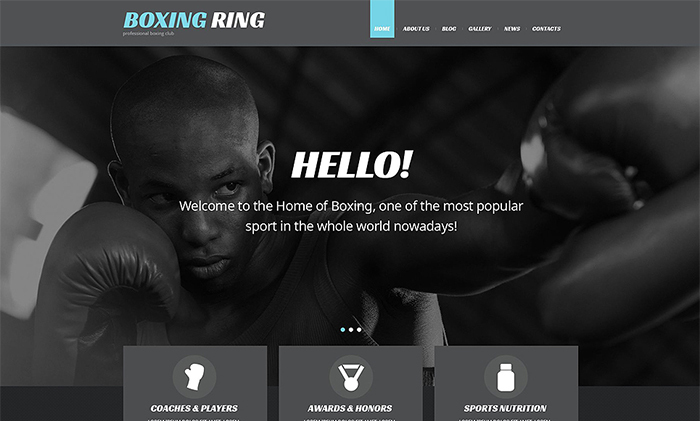 The Boxing is a powerful WordPress theme with a flexible and elegant design. This template can be selected for any sports website. The template has every required feature for building a nice looking website. 80+ shortcodes that are included with the template will make the page creation process much easier. With the multiple color options and with built-in theme customizer you can adjust the template to match your specific project. Your website visitors would be able to review it on any device since its fully responsive. Having all great customization tools and neat design the Surfing WordPress theme is a great choice for a water sports websites. With the full width layout you can make your content look great and accessible. The theme is equipped with a variety of custom widgets for comments, social sharing, etc. This WordPress theme is fully compatible with the latest WordPress version and with the WPML plugin. The template has a portfolio feature for showing up projects and works, and plus these could be separated by categories. 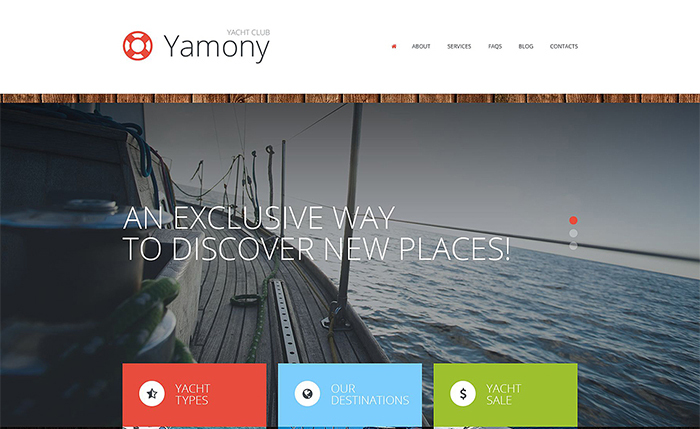 The Yamony WordPress theme is fully responsive theme stacked with bunch of customization tools and will match the yachting sport website. You will be able to finish up your website much faster since the template comes with the variety of pre-designed pages. An amazing full screen slider will focus your visitors attention on your featured events and services. The template is SEO friendly and optimized for faster load up. The Olark online chat included with the theme will help you to improve the communication process with your website visitors and clients. 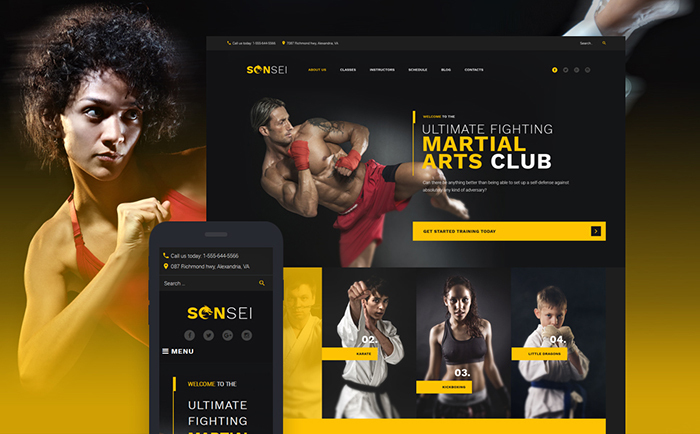 This Wordpres theme was developed to support and promote the martial arts industry. The template is fully customizable and with all its customizable instruments you can get it adjusted to any sports website. All colors are adjustable and the theme suits for users with no programming skills as well as for advanced programmers. 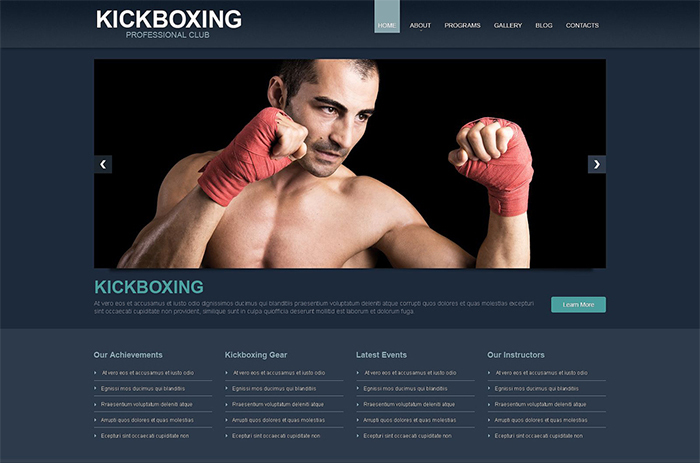 The Kickboxing WordPress theme is fully responsive and will adjust its layout in accordance with the screen resolution of the device its displayed on. The template is WPML ready which will help you implementing multilingual feature on your website. Nice choice for blogging and gallery images illustration. You can easily show up different extreme kinds of sport with the help of slider, variety of shortcodes and many dynamic effects. Theme, of course, is fully customizable and absolutely responsive, which makes it trendy. Stunning design, 100% responsiveness, ready made solution based on Cherry Framework 3 will perfectly fit any Yoga club. Theme goes WPML certificated for multilingual usage. It includes built-in customizer for editing color schemes, fonts and many other elements. This template is SEO friendly for better browsing search results. So, what do you say? Did any catch your eye? Sure, that yes. TemplateMonster’s top priority always is user friendly and easy-to-use themes creation, which, basically, avoids any problems in work. Moreover, all templates are well-documented and include detailed instructions on how to install and customize templates. In case you need some help while editing themes feel free to visit TM Help Center. On YouTube Channel you can also find many useful tutorials, FAQs, video instructions and discussions regarding the products. Is plug-ins influence the creation and maintenance of WordPress databases?